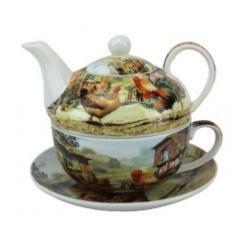 This Cockerel and Hen Tea For One is an ideal gift for a chicken lover who likes tea. This set has a china tea cup, saucer and mini tea pot too. The items all fit together for easy storage and come packed in a gift box.